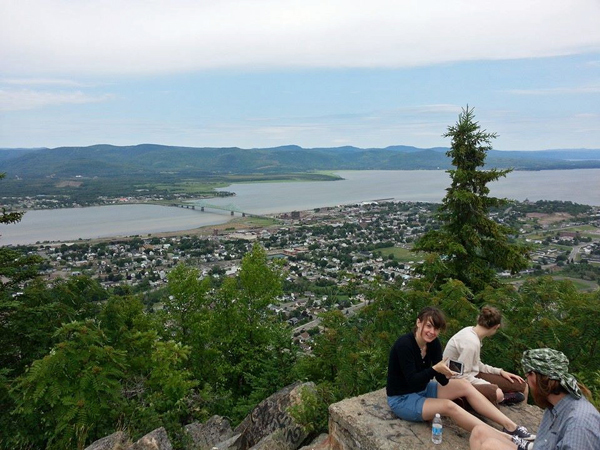 Douglas Gordon, an undergraduate linguistics major, spent his past summer in Listuguj, QC aiding the ongoing effort to revitalize the native Mi’gmaq language. He writes about the importance of such efforts and his enlightening experience in Listuguj. 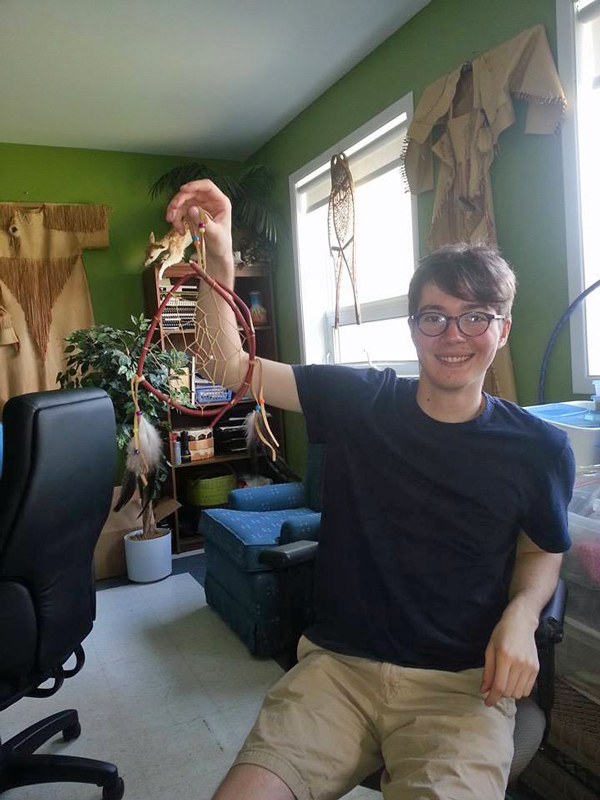 Linguistics undergrad Douglas Gordon and the dreamcatcher he made while in Listuguj, Quebec this summer. In Listuguj, Quebec, where I spent the greater part of this past summer, the native language is dying. 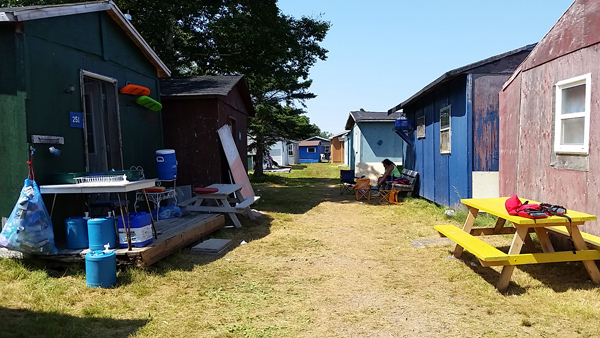 While there are some speakers of Mi’gmaq, very few are below the age of 50 – just the situation a language finds itself in before disappearing entirely. Listuguj is a First Nations reserve of some 4,000 people, many of whom feel the weight of this great loss. As an undergraduate majoring in Linguistics, I went to Listuguj as part of an ongoing partnership between the McGill Linguistics department and the Listuguj Education Directorate that aims to revitalize Mi’gmaq. I was sponsored by an internship award from the Arts Undergraduate Improvement Fund, without which my summer wouldn’t have been the same. While in Listuguj, I had the pleasure of taking Mi’gmaq classes with Mary-Ann Metallic, who has been teaching for the past seven years with a method she developed herself. At the start of the first class she asked the students – recent high school graduates from the reserve, none of whom spoke the language – what makes the Mi’gmaq people unique. She wrote on her chalkboard their answers: music, food, dress and, of course, language. As quickly as she wrote them up, she started crossing them off. She didn’t even need to ask about dress, seeing that every student was dressed indistinguishably from any other non-native Canadian. A view of Listuguj across the Restigouche River. Sometimes it can be difficult to explain to people that a language is worth saving. If language is simply tool for communication, the worth of a language can be measured by its number of speakers. Saving a language then seems to be the domain of that peculiar linguist who spends late nights ravenously and obsessively gobbling up the obscure grammatical morsels of forgotten languages. In truth, as much as linguists might fetishize languages, like a entomologist counting, classifying, recounting and reclassifying thousands of species of butterfly, saving a language is far from an abstract intellectual exercise. Language holds history. The traditions of the Mi’gmaq people, or of any culture, were created and explored through language. Whether it is basket weaving, building canoes, or an understanding of the natural world, from what leaves and berries are safe to eat to the migration patterns of caribou, knowledge is passed down through language. The colorful cabins of nearby Chapel Island, Nova Scotia. But it is not just knowledge that is passed down. Stories, poetry and music hold their roots in language. These are not merely past-times or entertainments, they form vital connections to the past – to what life used to be like, how it has changed and where it might go. Again, it is easy to disregard these things when there exists such a focus on the future – it seems more exciting and relevant to consider where you might be in five years, or the world in fifty, than what tools and techniques your ancestors used to fish for salmon. More than anything, however, language provides a sense of identity. Even without the history and culture that it carries through generations, language imbues an intangible but very real sense of “differentness.” Yet this differentness does not imply separation or segregation from society at large, but a sense of community in an increasingly globalized world. This differentness is important to the Mi’gmaq people and to the native people of colonized countries the world over. The Mi’gmaq people did not voluntarily abandon their own culture, but were torn from it through well-known and seldom-discussed policies of assimilation. Kathy, a woman who was kind enough to give me a room to sleep in while I was in Listuguj, had herself spent several years at an infamous residential school. I knew that children were taken from their parents to these schools, where they were beaten and forbidden from speaking their native tongues. But knowing the history is different than feeling it. Once, while drinking tea at her kitchen table after dinner, Kathy sang to me a song she wrote about her time at residential school. Somber and beautiful, it reminded me how difficult it is to navigate an issue that runs so deep for so many. To ignore the brutal history is foolish, and to try to undo it is futile. However, there are efforts than can be made within communities, and support than can be given from without, that express respect for Mi’gmaq people and the history they have suffered. 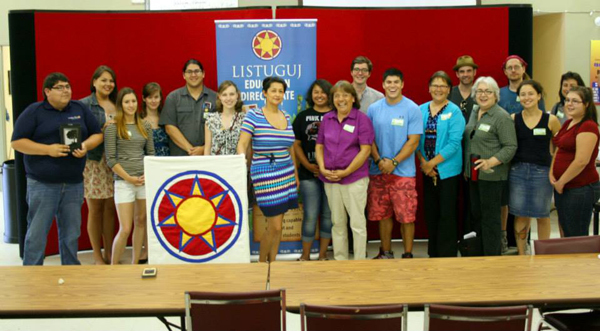 The team who helped put together the 2nd Annual Mi’gmaq Language Workshop. In my time in Listuguj, I met and spoke to so many who are dedicated to reviving Mi’gmaq language and culture. People are painstakingly compiling dictionaries, writing children’s books, developing online courseware, teaching immersion classes and directing movies – all of which promote language and culture alike. It was inspiring to see. Optimism abounds, yet the goals are great and there is so much work left to be done. Hope is not a choice when the stakes are this high. Culture unites, culture divides. Personal taste in such seemingly superficial things as music, food and dress is a part of who we are as individuals but is also what makes us part of a community. And language is at the crux of any culture – it is the means through which we interact with those traditions but foremost with each other, whether through earnest debate or idle chit-chit. A culture can thrive in isolation, but it is difficult for cultures to co-exist. At the best of times one absorbs the other and, at the worst of times one rips through the other in a catastrophic and tragic way that leaves all parties vowing not to let it happen again and wondering how it was allowed to happen in the first place. Language revitalization is one way of returning a sense of community and identity to long-oppressed people and reminding the world that the richness of a culture is not related to its ability to spread and conquer.